I've been asked a lot lately about my job as a bookseller and my duties as the "children's section person" (because I have no official title, but that section is mine and I do the bulk of the buying for it). Mostly, the questions all come down to: Who decides what goes on the shelf? How is it decided? 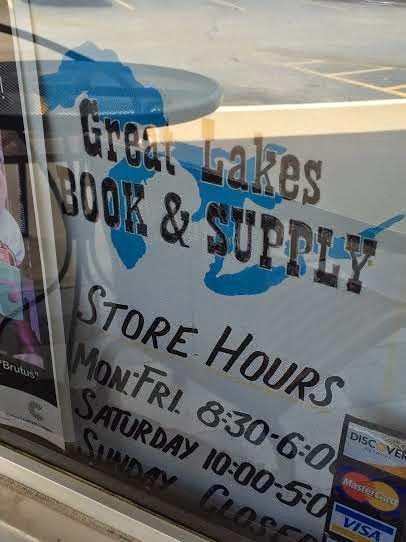 First, a brief history: I started working at my indie, Great Lakes Book & Supply (GLBS), in 2011. I was hired to work on the trade book floor and behind the front counter. At any given time, I have 1-3 co-workers who work on the trade book floor with me, and another 3 employees work in our textbooks department (we are a small university town). Our summers are quiet and we do brisk business during the school year. We also sell art supplies. We've been in business for over thirty years and we're in an excellent location at the center of town, only a block away from campus. When I began working in 2011, the large children's section was a bit of a mess. Certain sections had been cultivated, but others had been neglected. The YA section was...well, it just didn't exist. 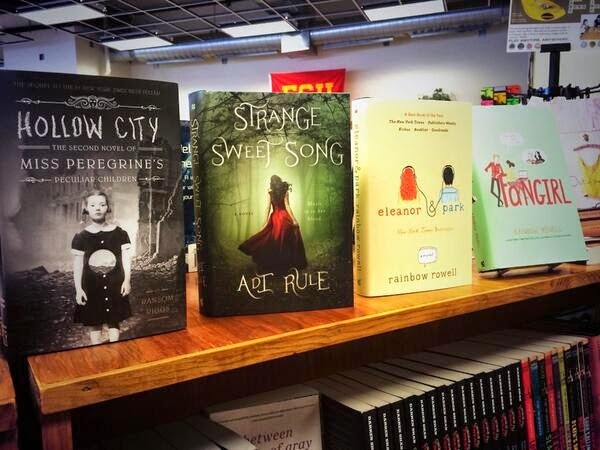 We had contemporary YA in one random corner, and speculative YA fiction was on a shelf with something called "Adolescent Supernatural." Yeah, I don't know what happened there, either. Thinking back to those darks days almost makes me want to cry. Sorting out the children's corner took almost two years. It was not a weekend project, but one undertaken over many weeks and requiring careful attention. It wasn't until last November that I finally got the configuration just about right--a sale wall, spacious picture book section(s), extensive children's nonfiction sections, and designated, clearly delineated chapter book, middle grade, and YA sections. Hooray! The shelves looked a little empty, but it was perfect--room to expand. One of the hard lessons I've had to learn as a bookseller is that what is popular in the blogosphere, among my friends, in publishing, and with my fellow VCFA students, is not going to automatically be popular at my bookstore. GLBS is its own little microcosm. It has its quirks and trends. They're mostly lovable. I can't stock everything. So I just have to do my best to understand the system and the people who shop with us. I find the local trends super fascinating. Some surprising hits in my store include the various Darren Shan horror series (and YA horror in general, particularly Brenna Yovanoff and Gretchen McNeil), Michael Grant's Gone series, and Kerstin Gier's time travel trilogy, Ruby Red, Sapphire Blue, and Emerald Green. 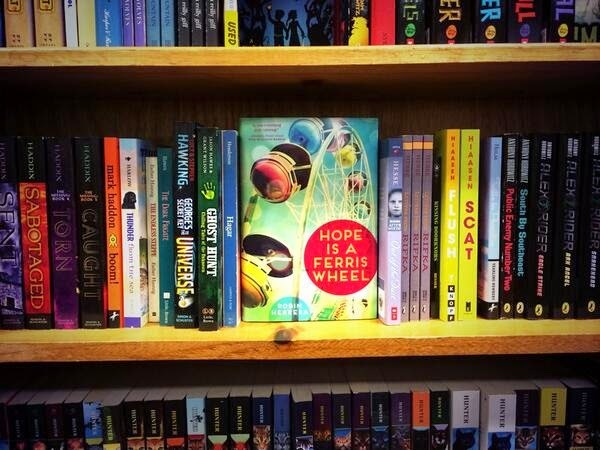 Surprisingly, contemporary YA fiction continues to be a hard sell unless it's written by John Green. Rainbow Rowell has been doing all right, but dystopian and supernatural fiction still reign supreme--my town is at least a good year behind major publishing trends. Booksellers must be well-read and willing to talk to customers of any age. Booksellers must be dynamic in everything they do, and excited to try new things. High energy levels and people skills are extremely important. A love of books is crucial, but it's not enough. That love should extend beyond adoration for book-shaped packages to include a love of good writing and an appreciation for all of the time, effort, and work that goes into creating books. Booksellers should have a compulsive need to share stories. Not having any qualms about talking to strangers is good, too. An understanding of the market, publishing processes, and traditional literature are arguably important, but I don't think they're essential knowledge for someone just starting out at their first bookstore job. That stuff will come if you are observant and willing to learn, and it can be picked up relatively quickly (and by quickly, I mean two years on the job). Everyone has to start somewhere and knowledge is fantastic, but if you can't talk to readers that knowledge won't do you one bit of good. So, to that end, here is my book purchasing process. It's messy and complex, and far from a perfect system. It's not without bias, and maybe a lot of errors. I have no idea how other booksellers or other stores goes about this process, so if there are any booksellers reading--share your thoughts with me! Please! Take pity on me. I'm self-taught. Once our book distributor, Ingram, has posted the next season's catalog of new books (Ingram Advance), I throw the proverbial confetti and get ready for some serious list-making. I love lists. I make my first list of books, marking new books that I know will be popular or will sell (next in series, paperback releases of hardcovers we've sold many copies of), and of books that I am pretty certain will sell (new books by popular authors in the store, debuts who have been getting a ton of buzz, paperback releases of hardcovers that have been doing reasonably well, or anything that I think I can handsell). Books that I think will make up for a lack of coverage or representation or debuts that I think look good go on a maybe list. I then will do my absolute best to follow up on these maybe books--whether it's talking to other bloggers or booksellers or friends from VCFA, looking up reviews (I read Publisher's Weekly magazine and BookPage regularly), or reading ARCs (usually provided to me on behalf of this blog). I then sort these books into MORE lists, organized by release month. So, I go through my next month's list of books (created from the season's catalogs) and I make decisions. Books I know will sell go on the list first, and I evaluate the sales of hardcovers before I put the paperbacks on that list. This requires going through our inventory system and checking sales history on every title. Paperbacks don't automatically go on the list, but if I only sell one hardcover (or none), they aren't automatically disqualified either. Keeping in mind the age level (MG hardcovers are a super hard sell, I'll always want to give paperbacks a chance), how well the book had been received, and if there has been a cover redesign, I'm likely to put the paperback on the order list. This is where personal taste and bias sort of come into play. If a hardcover hasn't sold, it's not because it's unsellable--it's likely that someone isn't willing to take a risk on a pricier book. If I liked the book, and I can talk someone into buying it, then having it on hand in paperback means it's a lot likelier to sell. Conversely, if we stocked a hardcover because it got a ton of buzz in the publishing world/on the internet, and it didn't sell, and no one I know has liked it or read, I'm more likely to just send it back and not get the paperback. Once again, these aren't rules. I can be swayed pretty easily. I like getting and keeping books in stock. It's not that I never want a book on my shelf (except maybe 50 Shades), but the question I am always asking myself is: Can I find a reader for this book? That really is the driving force behind this all. I want to match books and readers. Another reason I wait until two weeks before release month to submit my list is that initial release dates sometimes change between reading the season catalog and ordering. Not often, but it happens, and I need to get accurate information. I run reports on the YA and Adolescent (middle grade) fiction sections for sales in the previous month. I then go through each section alphabetically to assess whether or not books not in stock should be re-ordered, note how many copies of each book has moved, and what's on the shelf that didn't move. I also use this opportunity to make sure that we have enough popular books on hand and to make sure that everything that needs to be re-ordered goes on the weekly order list. It's also a great way to make sure that I haven't dropped the ball on re-stocking or other projects, and I get a lot of display ideas while doing this. It's sort of like a monthly health check-up on the section. Stock check, keep track of what's sold. Straighten shelves, re-arrange displays. Brainstorm displays and update as needed (usually every 1-2 weeks). Keep track of stock levels, submit changes or requests for re-orders as needed. I do the above process for both the YA and Adolescent sections because they are fast-moving, dynamic sections. They receive the most foot traffic and they have the highest number of sales in the children's section. In the children's corner, we also have a picture books section, a chapter book section, a Michigan kids' section, a board book section, a children's classic section, children's poetry, seasonal children's books, children's nonfiction, children's mythology, and a sale section. The sale section is pretty self-explanatory, but the other sections receive new books as we (my fantastic co-worker and I) discover new books, new editions of classics, or books we think we can sell and would make great additions to the store. Honestly, we could do a much better job at merchandising these additional sections, but there are only so many hours in a day. I think I should also note that currently, I share the trade book floor responsibilities with one other employee. The children's corner makes up maybe twenty percent of our trade book department. Not every section in our store gets this level of attention, sadly. YA is always neck-in-neck with General Fiction for the highest number of sales at any given time, so it's easy to justify spending that much time on that section, but there are other sections I would love to devote more time to--Science Fiction, Fantasy, Biography, Poetry. We have a very expansive General fiction section, a great Classics section, and a robust Cooking section. My co-worker and I make suggestions for the buying process, but ultimately all decisions rest with our manager, who makes a lot of buying decisions for the rest of the store. I'm lucky that she takes my suggestions for the children's corner and orders pretty much everything without question--and oftentimes surprises me by ordering things that I am hesitant to ask for, like the $100 boxed set of the Harry Potter books, which is gorgeous and lovely and definitely something that a bookseller would LOVE to receive for Christmas. I'm concluding with a compilation of questions I get asked a ton. Feel free to add your questions in the comments or email me at thecompulsivereader@gmail.com! Q: Do you stock diverse children's literature? A: As much as I possibly can! I created this display for #WeNeedDiverseBooks in May, which helped me highlight where our selection was lacking and lucky for me, I have great customers who are always requesting books and giving me suggestions, not to mention all of the fantastic resources I've found on the internet. Q: Do you ever buy books that you don't like or don't support on the blog? A: Absolutely. I think that a lot of people tend to think that I only order books I like or that booksellers only recommend their favorite books--not so. We love books, but we also are a business and we have to make money. There are a lot of books that I don't support or don't care for, but if there is a demand for them, we will carry them. There are also a lot of books that I dislike or disagree with that aren't in the store. Just like the presence of a book on a shelf doesn't imply that I love it, the absence of a book doesn't mean I hate it. (And unless you are a close friend and we're talking over a couple of drinks, I'm not likely to reveal which is which.) 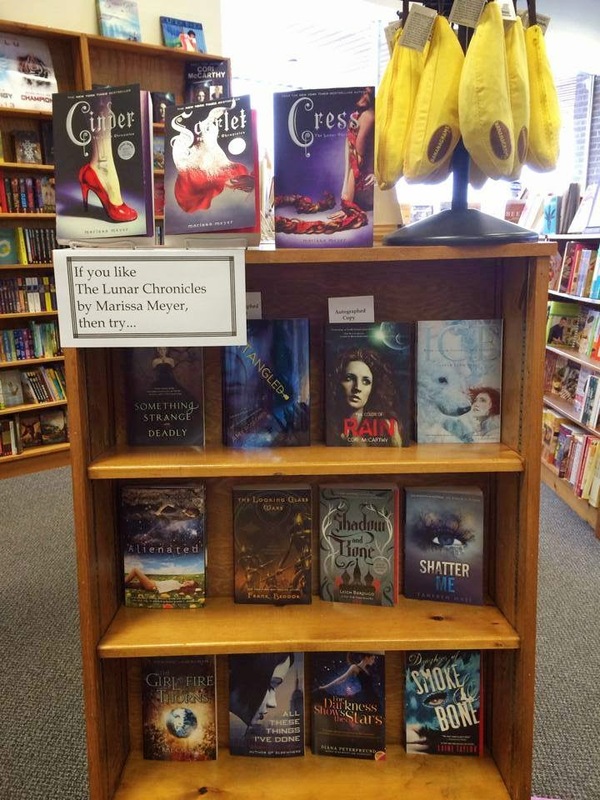 My job is to help the reader find books that I think they will enjoy. Q: How many hours do you think you spend per month researching and ordering new books? A: This is really tough to answer. In some way, I never stop researching and thinking about my stock. I'd say I spend about 3-4 hours a week while at work specifically on stocking--running reports, stock checks, looking up books, reading about books. I definitely spend more time during the weeks when I am placing an order for the next month or when the season catalogs come out, and that doesn't include the time I spend on processing and shelving new books when they come in. This also doesn't even begin to include the time I spend reading, which is usually done outside of work. If you ever catch me reading at work, it's likely I'm just reading a chapter here or there or looking something up or seeing, I don't know, what tense the book was written in or something ridiculous. Booksellers don't get much time to read at work, and I'll speak for myself when I say that's okay. I'd rather be talking to readers and you know, selling books. Q: So basically you just move books around and keep track of them all? A: Yes, but I have a shiny English degree and half of an MFA, so that makes me extra qualified to do so, don't you think? If you want to be simple and technical, yes. My job is keeping track of books, counting books, shelving books, selling books, and anticipating what books I should be selling. But to say that is all I do discredits the human interaction that goes into it all--every part of my job is permeated with the desire for human connection with books as a catalyst. I've had deeper conversations with strangers than I have had with some of my closest friends thanks to the books I sell. I am not a machine, I am not an algorithm. I'm a human being who wants every person who walks through the door to connect with a book (or books) and with other people. Q: What's the best way to make sure that my book is carried in an independent bookstore? Wow! This post is so fascinating. It sounds like you have an awesome and time consuming job. How many hours do you think you spend per month researching and ordering new books? Melanie: I'd say about 3-4 hours a week while at work, and more during the weeks when I do the ordering or what the season catalogs come out. This doesn't count the time I spend on reading.